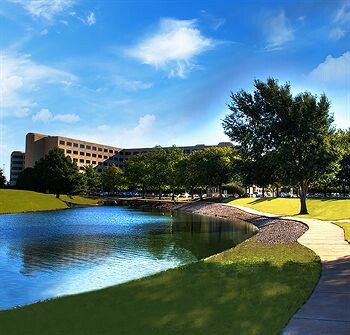 Property Location When you stay at Marriott Conference Center at NCED in Norman, you&apos;ll be in the business district and close to Jimmie Austin Golf Course and Gaylord Family - Oklahoma Memorial Stadium. This hotel is within close proximity of National Weather Center and Lloyd Noble Center.Rooms Make yourself at home in one of the 964 air-conditioned rooms featuring flat-screen televisions. Complimentary wireless Internet access keeps you connected, and cable programming is available for your entertainment. Private bathrooms with shower/tub combinations feature designer toiletries and complimentary toiletries. Conveniences include desks and coffee/tea makers, as well as phones with free local calls.Rec, Spa, Premium Amenities Pamper yourself with onsite body treatments and facials. You&apos;re sure to appreciate the recreational amenities, which include 4 spa tubs, a sauna, and a 24-hour fitness center. Additional features include complimentary wireless Internet access, an arcade/game room, and gift shops/newsstands. If you&apos;d like to spend the day shopping, you can hop on the shuttle (surcharge).Dining Enjoy a satisfying meal at a restaurant serving guests of Marriott Conference Center at NCED. Quench your thirst with your favorite drink at a bar/lounge. A complimentary hot/cold buffet breakfast is included.Business, Other Amenities Featured amenities include a 24-hour business center, a computer station, and express check-in. Planning an event in Norman? This hotel has 60000 square feet (5574 square meters) of space consisting of a conference center, conference space, and meeting rooms. A roundtrip airport shuttle is provided for a surcharge (available 24 hours), and free self parking is available onsite.